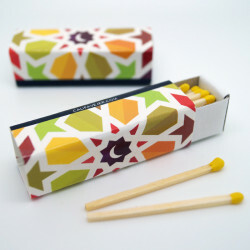 Matchboxes "Euro Hotel CMYK".· Size: 56x24x8 mm.· Offset Printing: CMYK (Euroscale).· Outside UV varnish.· Contains: 10 matches of natural wood.· Minimum order: 2.500 pcs.· Graphics and transport included (*).· Delivery time: from 4 to 6 weeks. 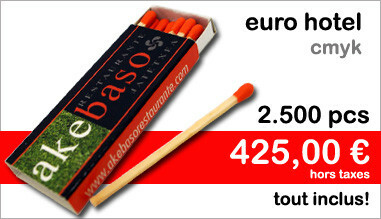 Matchboxes "Euro Golf CMYK".· Size: 56x17x17 mm.· Offset Printing: CMYK (Euroscale).· Outside UV varnish.· Contains: 20 matches of natural wood.· Minimum order: 2.500 pcs.· Graphics and transport included (*).· Delivery time: from 4 to 6 weeks. 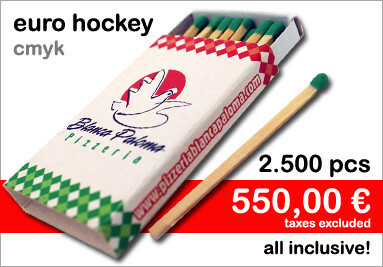 Matchboxes "Euro Hockey CMYK".· Size: 56x36x8 mm.· Offset Printing: CMYK (Euroscale).· Outside UV varnish.· Contains: 17 matches of natural wood.· Minimum order: 2.500 pcs.· Graphics and transport included (*).· Delivery time: from 4 to 6 weeks. 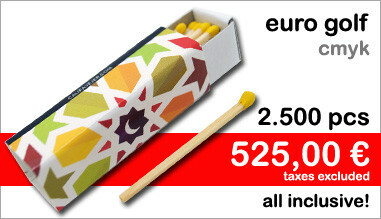 Matchboxes "Euro Club".· Size: 56x41x7 mm.· Offset Printing: Pantone or CMYK.· Outside UV varnish.· Contains: 20 matches of natural wood.· Minimum order: 2.500 pcs.· Graphics and transport included (*).· Delivery time: from 4 to 6 weeks.· Optional: black or red wood. 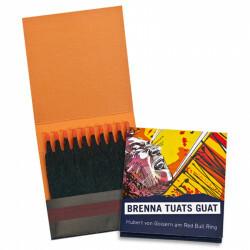 Matchbooks "Book 1x9".· Size: 45x50x3 mm.· Offset Printing: Pantone or CMYK.· Outside UV varnish.· Contains: 9 matches of natural wood.· Minimum order: 2.500 pcs.· Graphics and transport included (*).· Delivery time: from 4 to 6 weeks.· Optional: black, red, orange, green, yellow or blue wood. 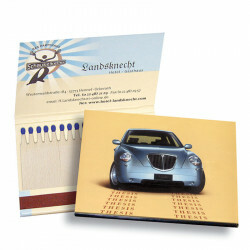 Matchbooks "Book 2x10 Luxus".· Size: 55x50x5 mm.· Offset Printing: Pantone or CMYK.· Outside UV varnish.· Contains: 20 matches of natural wood.· Minimum order: 2.500 pcs.· Graphics and transport included (*).· Delivery time: from 4 to 6 weeks.· Optional: black, red, orange, green, yellow or blue wood. 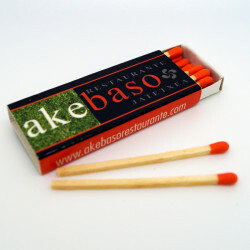 Matchbooks "Baseball 18".· Size: 70x50x3 mm.· Offset Printing: Pantone or CMYK.· Outside UV varnish.· Contains: 18 matches of natural wood.· Minimum order: 2.500 pcs.· Graphics and transport included (*).· Delivery time: from 4 to 6 weeks.· Optional: black, red, orange, green, yellow or blue wood. 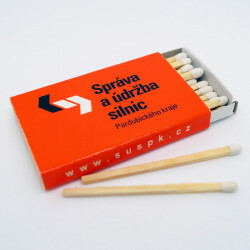 Matchbooks "Heart 2x9".· Size: 70x65x5 mm.· Offset Printing: Pantone or CMYK.· Outside UV varnish.· Contains: 18 matches of natural wood.· Minimum order: 2.500 pcs.· Graphics and transport included (*).· Delivery time: from 4 to 6 weeks.· Optional: black, red, orange, green, yellow or blue wood. 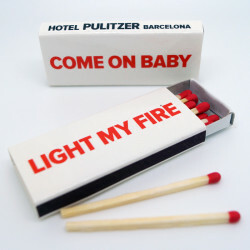 Matchboxes "Hotel".· Size: 56x24x8 mm.· Offset Printing: Pantone or CMYK.· Outside UV varnish.· Contains: 12 matches of natural wood.· Minimum order: 3.000 pcs.· Graphics and transport included (*).· Delivery time: from 4 to 6 weeks.· Optional: black wood. 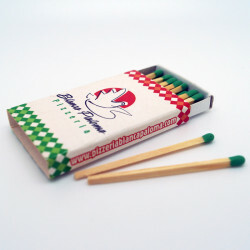 Matchboxes "Café".· Size: 56x36x8 mm.· Offset Printing: Pantone or CMYK.· Outside UV varnish.· Contains: 18 matches of natural wood.· Minimum order: 3.000 pcs.· Graphics and transport included (*).· Delivery time: from 4 to 6 weeks.· Optional: black wood. 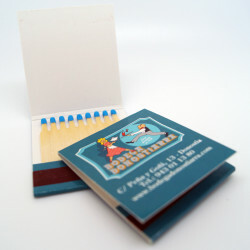 Matchbooks "Book 2x9".· Size: 45x50x5 mm.· Offset Printing: Pantone or CMYK.· Outside UV varnish.· Contains: 18 matches of natural wood.· Minimum order: 2.500 pcs.· Graphics and transport included (*).· Delivery time: from 4 to 6 weeks.· Optional: black, red, orange, green, yellow or blue wood. 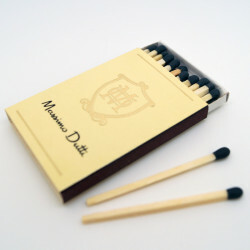 Matchboxes "Euro Hotel".· Size: 56x24x8 mm.· Offset Printing: Pantone or CMYK.· Outside UV varnish.· Contains: 10 matches of natural wood.· Minimum order: 2.500 pcs.· Graphics and transport included (*).· Delivery time: from 4 to 6 weeks.· Optional: black or red wood. 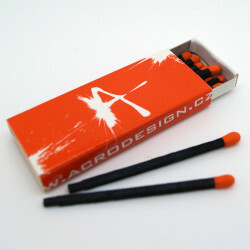 Matchboxes "Candle 20".· Size: 85x42x12 mm.· Offset Printing: Pantone or CMYK.· Outside UV varnish.· Contains: 20 matches of natural wood. 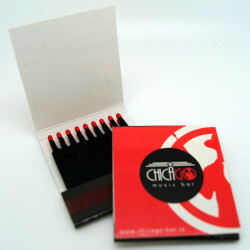 (75mm)· Minimum order: 500 pcs.· Graphics and transport included (*).· Delivery time: from 4 to 6 weeks. In most of our shipments with possibility of transport by road. 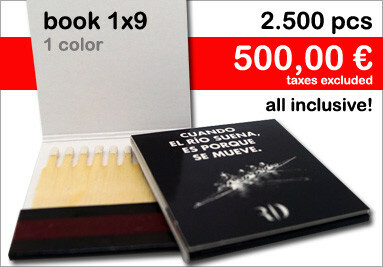 We can answer your phone calls in Spanish, other languages, please contact by email. We offer several possibilities for secure payment of your order. 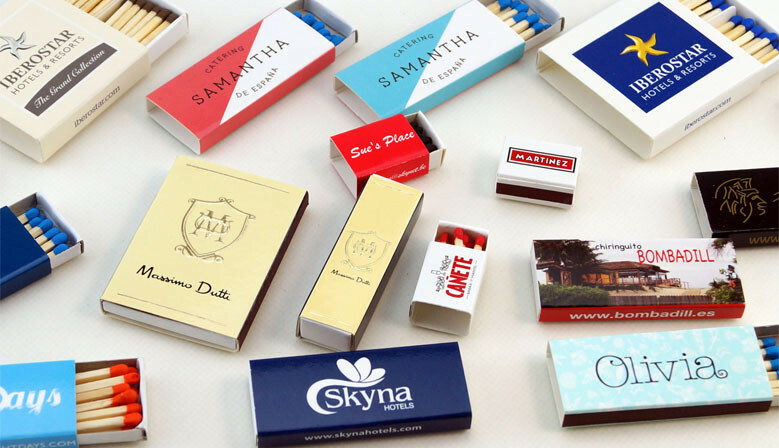 Matchboxes with personalized printing for advertising, different shapes and sizes. 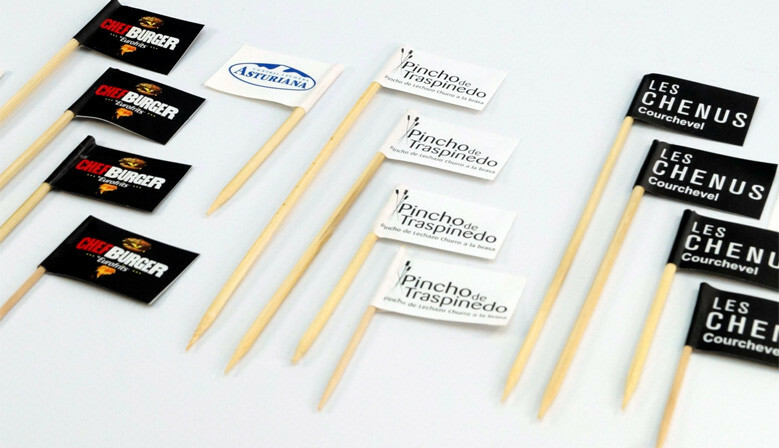 High quality with the shortest delivery time. 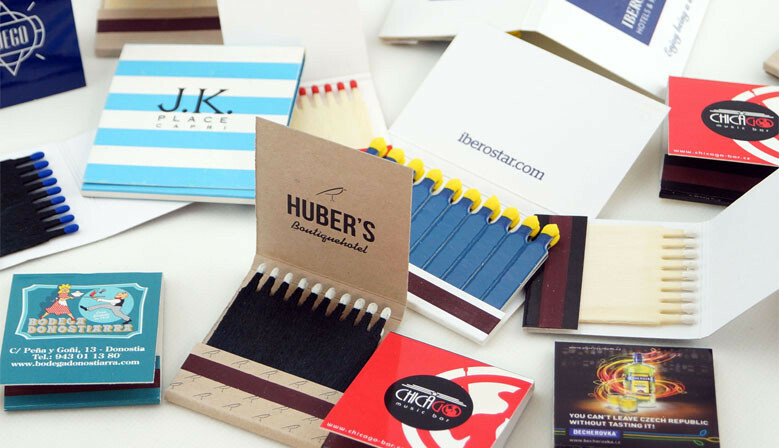 Matchboxes are a perfect promotional gifts of very low priced unit, as well as toothpicks, ashtrays and promotional boxes. Receive your factory direct order. 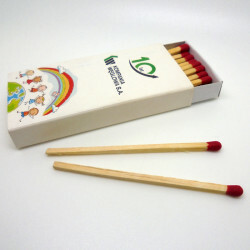 Our matchboxes are manufactured in Europe, complying strictly with quality and safety controls and are 100% biodegradable.